A 13-year-old Thoroughbred gelding used for eventing presented with acute neck stiffness after a fall. On clinical evaluation, his vital parameters (HR, RR, Temp.) were within normal limits. He was reluctant to actively bend the cranial aspect of his neck to either direction. No significant neurologic signs were found on examination. Palpation of his neck revealed mild to moderate swelling around the area of C2 to C4 bilaterally. What would be you next step during the examination? What is your radiographic diagnosis? Figure 4: Lateral view of the second to fourth cervical vertebra showing a comminuted caudal ventral vertebral body fracture of C3 with involvement of the intercentral vertebral joint between C3 and C4 (white oval). Figure 5: Left lateral 50° ventral- right laterodorsal view of the second to fourth cervical vertebra showing a comminuted caudal ventral vertebral body fracture of C3 with involvement of the intercentral vertebral joint between C3 and C4 (white oval). Figure 6: Right lateral 50° ventral- left laterodorsal view of the second to fourth cervical vertebra showing a comminuted caudal ventral vertebral body fracture of C3 with involvement of the intercentral vertebral joint between C3 and C4 (white oval). 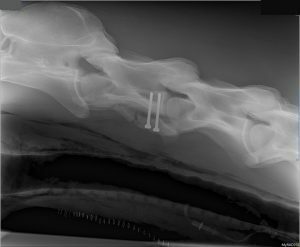 What therapeutic options would you consider in this case? 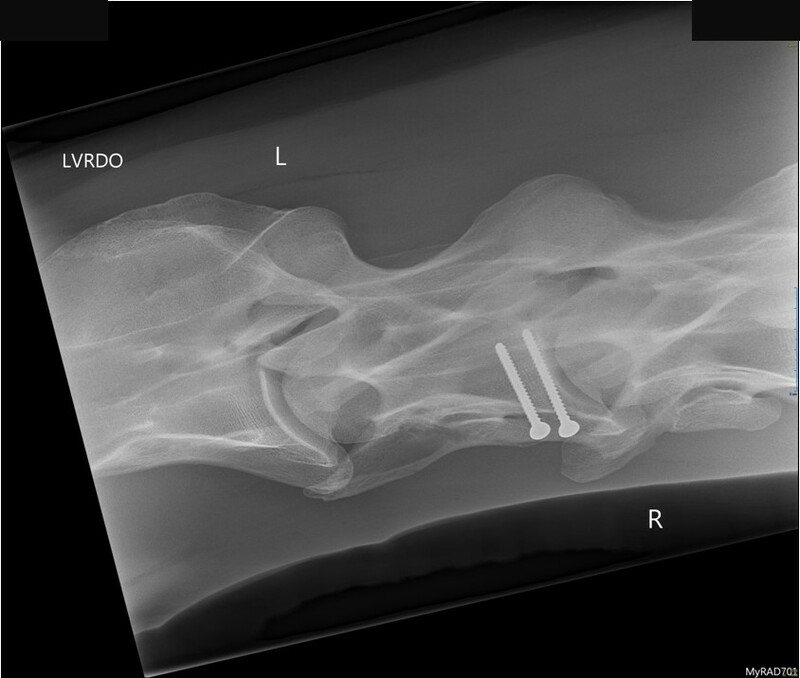 Internal fixation of the fracture. Due to the displacement and instability of the fracture, conservative treatment with stall rest would most likely result in significant callus formation at the level of the intercentral vertebral joint between C3 and C4, which further causes osteoarthritis of the joint and continued discomfort after healing. 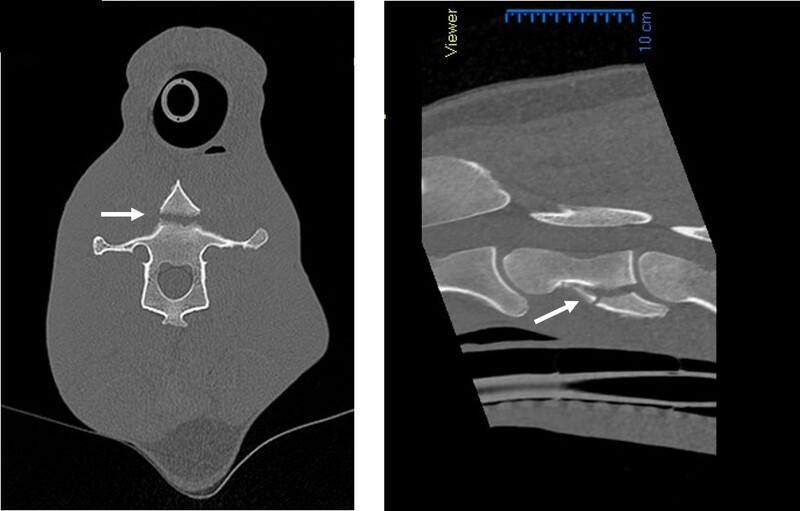 Computer tomography under general anesthesia and in dorsal recumbency was used to map out the fracture (Figure 7) and 3D reconstruction (Figure 8) was used to further plan internal fixation using two cortical screws in lag fashion to stabilize the ventral vertebral process of C3 and reduce callus formation within the adjacent intercentral joint (Figures 9, 10, 11). 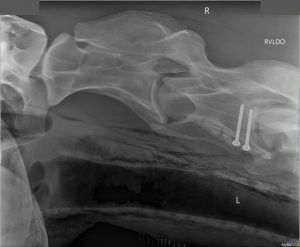 This examination confirmed a ventrally displaced, comminuted, articular fracture of the caudal third of the ventral body of the third cervical vertebra. Figure 7: Sagittal (left) and longitudinal (right) CT image of the ventral vertebral body fracture of caudal C3. White arrows pointing to the fracture line. 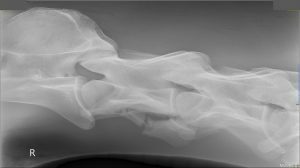 Figure 8: Longitudinal (left) and sagittal (right) CT 3D reconstruction image of the ventral vertebral body fracture of caudal C3. 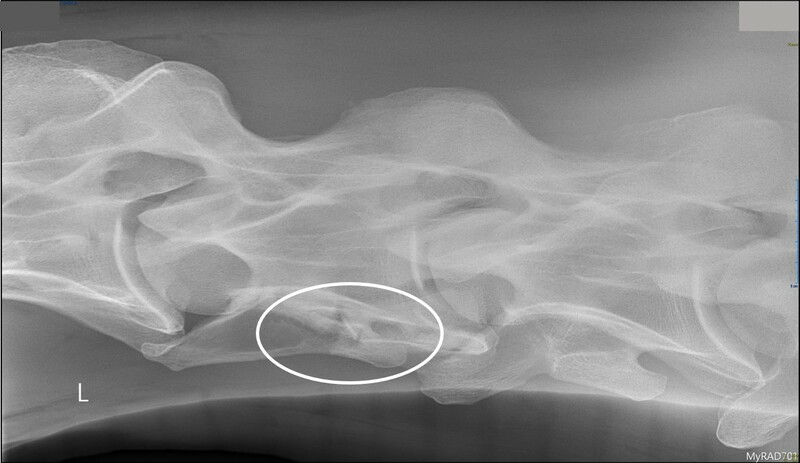 White arrows pointing to the fracture line. 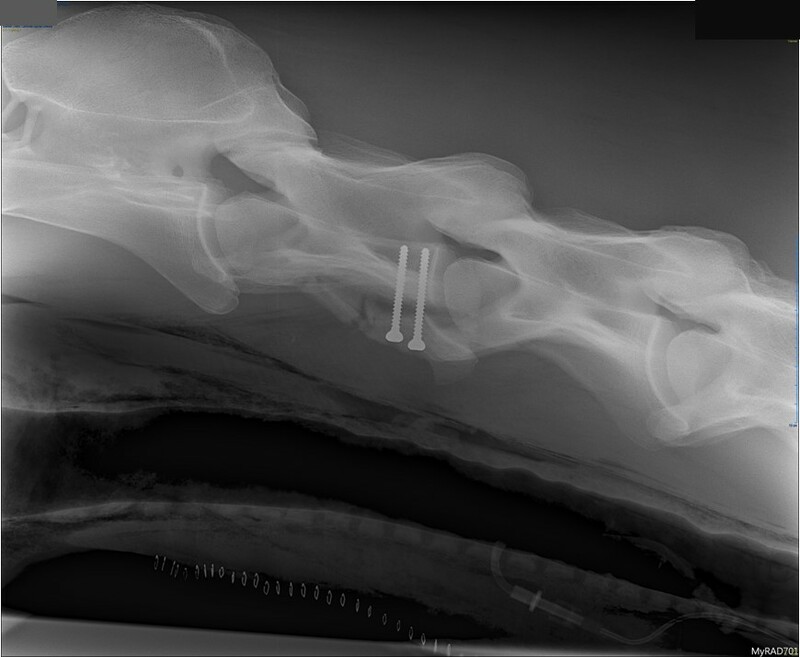 Figure 9: Lateral view of the second to fourth cervical vertebra post-operatively showing two 4.5 mm cortical screws placed in lag fashion to stabilize the fracture. 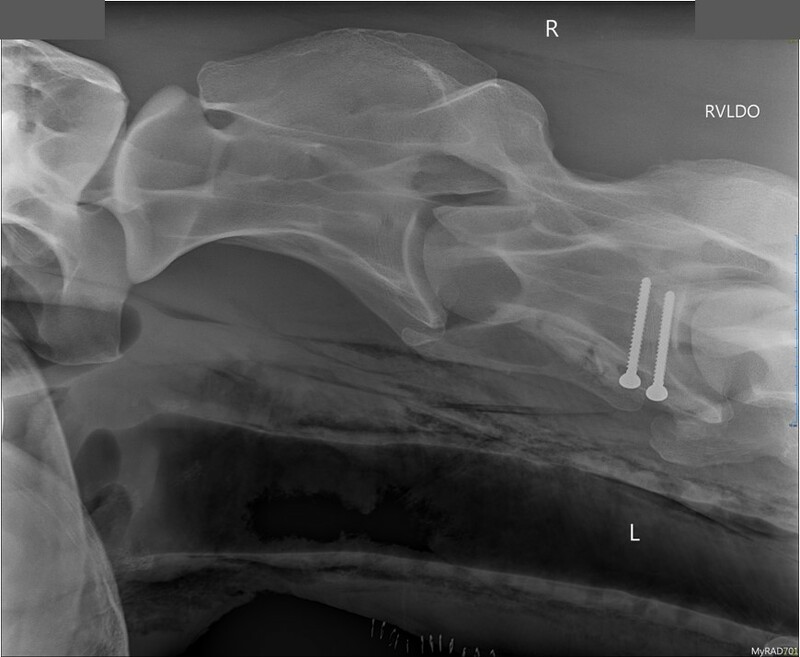 Figure 10: Left lateral 50° ventral- right laterodorsal view of the second to fourth cervical vertebra post-operatively showing two 4.5 mm cortical screws placed in lag fashion to stabilize the fracture. Figure 11: Right lateral 50° ventral- left laterodorsal view of the second to fourth cervical vertebra post-operatively showing two 4.5 mm cortical screws placed in lag fashion to stabilize the fracture. 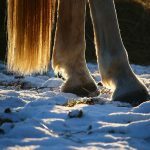 After surgery, the horse was kept on stall rest for two weeks followed by stall rest with hand-walking exercise. Re-evaluation after eight weeks revealed the surgery site healing well, good range of motion of the neck, and no pain on palpation. 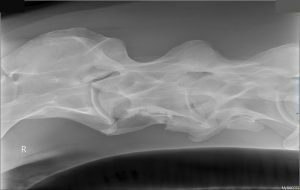 Radiographic re-evaluation revealed healing of the fracture and the exercise was increased to walking under tack for four weeks followed by walking and trotting under tack for another four weeks. 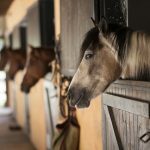 As additional rehabilitation, the horse underwent stretching exercises three times per week. 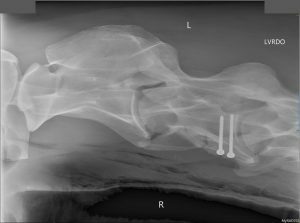 Re-evaluation at 10 months after surgery revealed full range of motion of the gelding’s neck and radiographs did not reveal any significant callus formation. (Figures 12, 13 ,14). 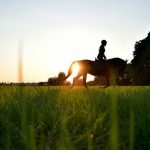 The horse was able to return to eventing. Figure 12: Lateral view of the second to fourth cervical vertebra at 10 months post-operatively showing bony healing without significant callus formation within the intercentral vertebral joint between C3 and C4. Figure 13: Left lateral 50° ventral- right laterodorsal view of the second to fourth cervical vertebra at 10 months post-operatively showing bony healing without significant callus formation within the intercentral vertebral joint between C3 and C4. Figure 14: Right lateral 50° ventral- left laterodorsal view of the second to fourth cervical vertebra at 10 months post-operatively showing bony healing without significant callus formation within the intercentral vertebral joint between C3 and C4. 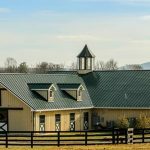 Neck pain in horses is often recognized by reduced range of active motion, an abnormal head carriage or, in milder cases of neck pain, neck stiffness or reluctance to move forward under tack. Differential diagnoses for cervical pain are osteoarthritis of the cervical facet joints, osteochondrosis, nuchal ligament or nuchal bursa inflammation, muscular disorders or cervical vertebral fracture or subluxation/luxation. In patients with acute cervical fractures neck pain is pronounced. Depending on the anatomical part of the vertebra involved and the degree of displacement of the fracture fragment or the degree of collapse of the spinal canal, clinical signs of cervical fractures can vary from neck pain with or without neurologic deficits to sudden collapse or death. 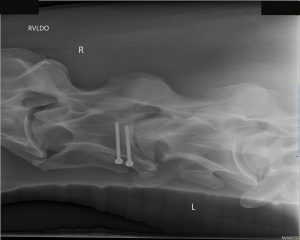 Neurological signs were not noted in this case since the fracture fragment did not invade the spinal canal, but the horse showed signs of pain and reluctance to bend his neck, both of which improved following internal fixation. 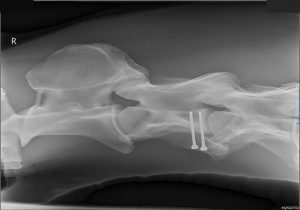 Successful repair of a ventral vertebral body fracture was achieved by placing two cortical 4.5 mm screws in lag fashion through the largest bony fragment of the comminuted fracture. This stabilized the ventral vertebral process and allowed the reconstruction of the intercentral vertebral joint between C3 and C4. 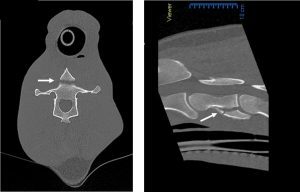 CT evaluation, in this case, was essential to establish accurate measurements and surgical planning. CT allows for better planning of the internal fixation, including screw length and positioning (essential to avoid penetration of the spinal canal) due to the view of the fracture in a transverse, frontal and longitudinal planes without overlapping structures, as well as 3D reconstruction of the fracture site. During surgery, accurate screw placement was monitored by fluoroscopy. Stabilization and reduction of the fracture by means of internal fixation allowed for healing to occur without significant callus formation within the intercentral vertebral joint. 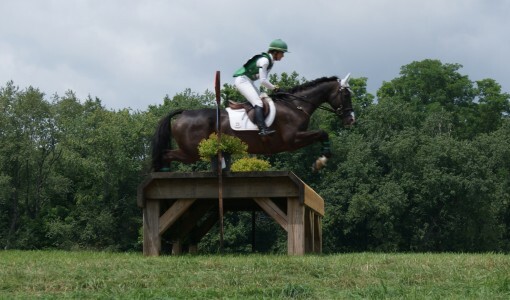 This allowed the horse to return to its pre-injury eventing exercise level. 1. Pinchbeck G, Murphy D: Cervical vertebral fracture in three foals. Equine Vet Educ 13:8, 2001. 2. Mayhew IGJ: Cervical vertebral fractures. Equine Vet Educ 21:536, 2009. 3. Robertson JT and Samii VF. Traumatic disorders of the spinal column. In: Auer JA and Stick JA (eds.). 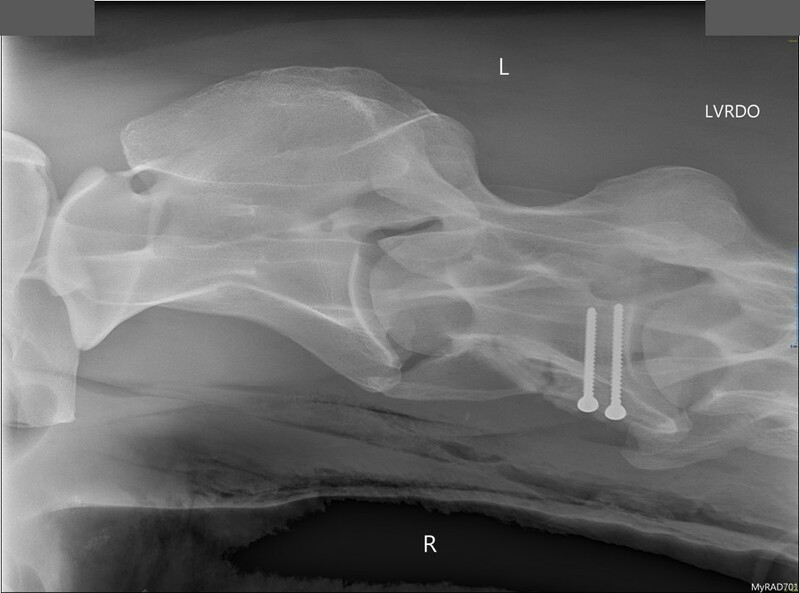 Equine Surgery, 4th edition, Elsevier, St. Louis, p. 711-719. Dr. Kirstin Bubeck is a Diplomate of the American College of Veterinary Surgeons 2011, and a Diplomate of the American College of Veterinary Sports Medicine and Rehabilitation 2013. She earned her veterinary degree from the University of Hannover, Germany in 1997 and came to the Hospital for Large Animals to pursue further training in large animal surgery and successfully completed her large animal surgery residency in 2009. 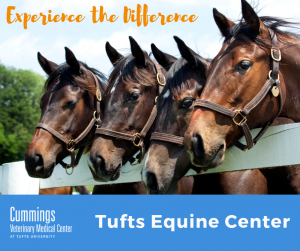 Dr. Bubeck returned to the Hospital for Large Animals as a faculty clinician in the Equine Sports Medicine and Surgery Service in June 2014. She has a strong interest in orthopedic and respiratory surgery as well as lameness evaluation and diagnostic ultrasound.